- Aqui Nasceu Portugal (Portugal was born here) is located on the back of the neck. This is the motto of Guimarães. For whatever reason it has been quite a struggle buying Portuguese shirts that aren't from the traditional top three teams. 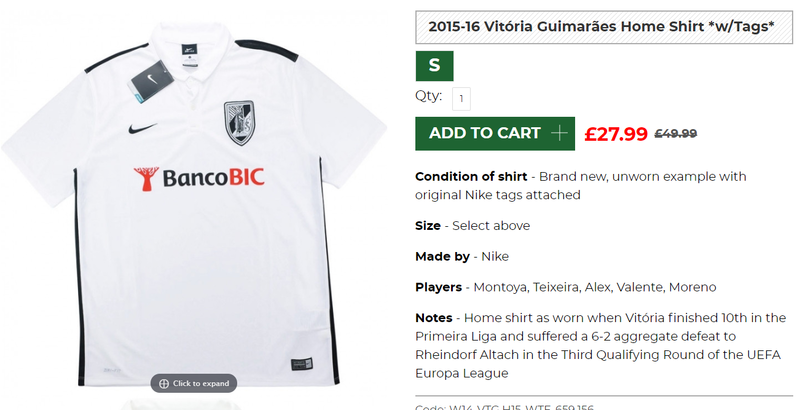 I have seen a few shirts from this club for sale before but all of them came sans the sponsorship. When this shirt popped up for sale I knew that I had to add it to my collection. The shirt is fairly plain but I think it looks good. The club logo is one of the biggest ones that I have seen. Maybe if that was a bit smaller then this shirt would be even better. Vitória play the derby of Minho Province against neighbours Braga. This derby is considered one of Portugal's most intense fixtures, as both clubs battle each year to reach a European competition. The derby also intensified during the run-up to the Euro 2004 tournament hosted by Portugal, as both clubs had new stadia built as tournament venues.